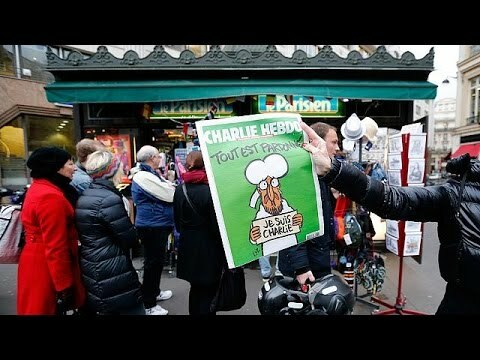 The Wednesday edition of Charlie Hebdo (a week after the barbaric attack by two deranged terrorists on its premises) carried a cartoon of Prophet Muhammad, with a caption “Je Suis Charlie”, with a tear drop on his face announcing, “all is forgiven”. It is not clear who is forgiven and for what, but if it refers to the terrorists it certainly is not appropriate. This time the magazine did not publish only 60,000 copies as it usually does, but three million copies, thanks to the generous help that it has received from various sources and also with the help of cartoonists from all over the world. This is as it should be, because in the final analysis freedom of expression tops all other considerations, as it is at the root of all other liberties and the quality of life that we enjoy in democratic societies. More than three million people demonstrated in Paris and other French cities on Sunday, carrying the sign “Je Suis Charlie”. This did not mean that they agreed with everything that Charlie Hebdo stood for, but they wished to uphold the right of that satirical magazine to express itself freely. Only a few days before the attacks in Paris, Pen America published a disturbing report on “Global Chilling. The Impact of Mass Surveillance on International Writers”, showing that mass surveillance by the United States and other governments had produced a very negative effect on free expression, leading to self-censorship. It further showed that concern about surveillance was almost as high among writers living in democracies (75%) as it was among those living in non-democratic states (80%). It would be tragic if the killing of a few journalists in Paris were allowed to result in greater self-censorship and to curtail freedom of expression. The terrorists and those who wish to limit freedom of expression by violent means should learn that far from forcing others to silence, their acts will backfire and will have the opposite effect. If the terrorists intended to help the cause of Muslims in the world, it has had precisely the opposite effect and has intensified a climate of suspicion and cultural clash between Islam and the West. It should be added that the terrorist outrage was not an Islamic act against Christians, Jews and secularists. It was the act of two terrorists against Muslims, Christians, Jews and people of no faith. At a kosher grocery store in Paris, where four people were killed, a quick-thinking Muslim employee, Lassana Bathily, a young immigrant from Mali, hid several Jewish shoppers in the basement before sneaking out to brief police on the hostage-taker upstairs. Initially confused by the police for the attacker, he was forced to the ground and handcuffed. Once the police realized their mistake, he provided them with the key they needed to open the supermarket’s metal blinds and mount their assault. It is important to remember these facts in order to realize that although the two terrorists acted in the name of Islam their vile act had nothing to do with Islam and was an indiscriminate act of barbarism. It was not an act of piety, but of rage by a group of semi-literate militants and petty criminals, with very little knowledge of Islam, who had visited a number of trouble spots in the Middle East, Iraq, Syria and Yemen and who had been radicalized due to what they saw as Western attacks on their fellow Muslims. Seeing the many heads of states walking arm-in-arm in support of free speech in Paris, one of the journalists at Charlie Hebdo accused them of hypocrisy, because many of them had in the past taken the paper to court for alleged insult. The crowd included representatives of Saudi Arabia, where in addition to many other violations of human rights, the punishment for journalists who “insult Islam” is flogging; from Turkey, which has the largest number of journalists in jail; from Israel, which in addition to its massacre of 2,300 innocent people, including at least 500 children, also killed 13 journalists, during the barbaric attack on Gaza last July. It is also fair to point out that even Charlie Hebdo is not free from hypocrisy. One of its own journalists, Maurice Sinet, was fired for an allegedly “anti-Semitic” cartoon. When commenting on the engagement of the then-President Nicolas Sarkozy’s son to a Jewish woman amid rumors that the younger Sarkozy planned on converting to Judaism, under a picture of the son, Sinet wrote: “He’ll go a long way in life, that little lad.” Not only was that enough for him to be fired, he was subsequently taken to court by the Ligue Internationale Contre le Racisme et l’Antisémitisme (LICRA), an organization that fights anti-Semitism. So sadly, the defense of freedom both by the weekly and by most of those who suddenly became the champions of free speech has been quite selective. Some people have used the recent events to give vent to their anti-Islamic sentiments. In an article on the DISSENT website, Michael Walzer, a professor emeritus at Princeton, criticized those who have refrained from criticizing Islam, fundamentalist Islam and jihadists, suggesting that they are closely connected. A prominent columnist at The Times of London David Aaronovitch in an article under the headline “Our cowardice helped to allow this attack” wrote: “Decency towards Muslims – laced with certain fear – has made Britain reluctant to satirise their religion openly”, and called for more use of satire. Yet, he has always been one of the most outspoken defenders of Israel and very liberal with the use of the term “anti-Semitism” against those who have criticized Israel’s oppressive policies. He has even accused fellow Jews of being anti-Semitic or “self-haters”. He was also one of the most ardent supporters of the Iraq War. Nigel Farage of the UK Independence Party, in an interview with Channel 4 News, said the Paris attack was the result of a “fifth column” living in the West. A large number of people continue to associate Islam with violence. The Dutch right-wing agitator Geert Wilders, leader of the Party for Freedom, describes the Koran as a “fascist book” and calls for it to be outlawed (as Mein Kampf is) in the Netherlands. However, during the past week, the issue of freedom of expression versus the desire not to give offense has resulted in a great deal of soul searching. More thoughtful writers have tried to balance freedom of expression with the responsibility not to offend. In his “thought for the day” on Radio 4, Dr. Sam Wells, Vicar of St. Martin-in-the-Fields, argued that the terrorists committed their crime allegedly in support of a sacred idea, Prophet Muhammad, who according to them had been reviled in a most hurtful way in the cartoons in Charlie Hebdo. However, while the concept of liberty is also sacred to many people, it is not something that one has to worship at any cost. Liberty can be elevated as an article of faith and worshipped as a god. Referring to the French motto of liberty, equality and fraternity, he argued that the idea of liberty should be combined with the idea of fraternity. Sometimes the idea of liberty clashes with the concept of fraternity. We are not free to go to a crowded cinema and shout fire in order to prove freedom of expression. In the same way, if some elements of free expression clash with fraternity, it is important to pay at least some attention to the concept of fraternity as well. Truthfulness requires love. He argued that we have forgotten the third motto. It means that we must have some concern for the feelings of our fellowmen. The challenge is not whether to have freedom of expression but how to exercise this virtue that would increase love and would enable us to live together. In a thoughtful article in The New Yorker, Teju Cole reminded us of the atrocities that were committed against “heretics” in Europe due to excess of zeal, but in the same way that they had nothing to do with Christianity the criminal acts of some modern Muslim radicals have nothing to do with Islam either. He pointed out that the most extreme criticisms and satires of Charlie Hebdo had been aimed at Muslims, and it had taken particular joy in flouting the Islamic ban on insulting the prophet. He added that the events of the past week took place against the backdrop of France’s ugly colonial history, especially against the independence movement in Algeria. While it is important to be conscious of the hurtful nature of some comments and be aware of the feelings of others, personally I side with the excellent “thought for the day” delivered by Mona Siddiqui, Professor of Islamic Studies, New College, at the University of Edinburgh. I would go further and say that had it not been for the courage and determination of some great thinkers, mystics and prophets to go against the views of the time and say what went against the accepted dogma of the time and was regarded as blasphemous our civilization would not have evolved. Lack of freedom of expression led to the fanaticism and ignorance of the Dark Ages. Lack of freedom in contemporary Muslim societies means that Christians or even Shi’ites cannot build a church or a mosque in Saudi Arabia, and the large number of Sunnis in Tehran cannot build a new mosque in the capital. It means that Baha’is who constitute the largest religious minority in Iran cannot send their sons and daughters to universities, and even when they try to organize classes for them they are sent to jail. Lack of freedom of expression means that fanatics can attack a school in Pakistan and kill more than a hundred innocent pupils. Satire exposes the stupidity of the fundamentalists in all religions. Fundamentalists are people who take everything too seriously, and who lack a sense of humor. The satirists expose those who are incapable of laughing at themselves and at their weird beliefs. If we wish to get rid of ignorance and stupidity, we must have the courage to speak out even at the risk of offending others. Farhang Jahanpour is a former professor and dean of the Faculty of Foreign Languages at the University of Isfahan. He has also taught at Cambridge and Oxford universities and was also a senior Fulbright research scholar at Harvard.